Vintage From Paul is delighted to offer this sparkling Durand Cristal D'Arques Golden Vineyard Seven Pc Decanter Set. 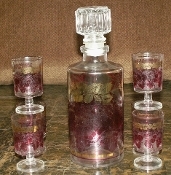 The set includes one stoppered decanter and 6 cordial/liquor glasses. The clear glass of the decanter as well as the glasses is decorated with deep burgundy grapes and cherries, flowing vines all accented with 22 carat gold leaves. The Durand Cristal D'Arques Golden Vineyard Seven Pc Decanter Set is in pristine condition with no wear to the graphics or gold detailing. This set appears to be unused. The Decanter stands 8-1/2 inches in height with the stopper in place, 6-1/2 inches without the stopper in place. The base diameter of the decanter is 2-7/8 inches. The glasses stand 3-1/2 inches in height and measure 2-5/8 inches in diameter at the top.